The following routes are approved or involve corridors where the number has been agreed upon by planners, government, or other organizations. In many instances future Interstate shields or guide signs may be found on the approved route. 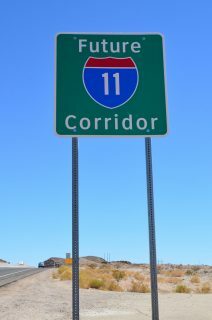 Future Interstate 11 sign posted just south of Kingwam Wash Access Road along U.S. 93 near Hoover Dam. Photo taken 07/22/14. 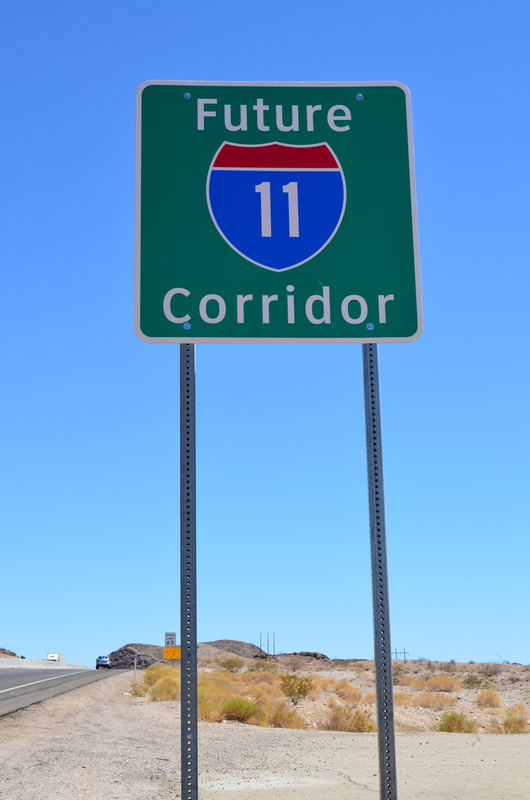 Interstate 11 is one of the newest corridors planned for the Interstate system. The route will link Phoenix and Las Vegas initially and may someday extend northward to Reno. 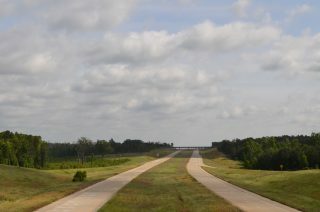 Looking north at the unopened travel lanes of Interstate 49 from the Louisiana 168 overpass near Ida. Photo taken 05/20/14. Interstate 49 was completed across the Louisiana and Arkansas state line on November 10, 2014. The section in Louisiana features 75 MPH speed limits. Disclaimer: These potential corridors proposals are not endorsed, supported, or recognized by the Federal Highway Administration (FHWA), the American Association of State Highway and Transportation Officials (AASHTO), any state Departments of Transportation (DOTs), or other official organizations. They are strictly derived from other sources, including appropriations within Congressional legislation, journal articles, and other research. Currently there are no definite plans to build any of these corridors as Interstates in the future. Use Interstate 135 beginning at Wichita and proceed north on this present route until Salina, Kansas, then follow U.S. 81 north to Concordia, Kansas. At that point, the corridor would curve northeasterly to enter Nebraska just south of Fairbury and proceed northeast to Beatrice. At Beatrice, the corridor would proceed northerly via U.S. 77 to Lincoln. The route would then proceed north of Lincoln following U.S. 77 through Fremont and north until it crosses the Missouri into Iowa. The corridor would terminate at Interstate 29 in Iowa in or near Sioux City. The route could be extended northeasterly via Iowa 60 into Minnesota if desired. This corridor would connect Sioux City to Lincoln, Wichita, Oklahoma City, Dallas-Fort Worth, Sioux Falls, Fargo, and Winnipeg. Follow Option 1, but route the corridor directly north along U.S. 81 to meet Interstate 80, then continue with an at-grade expressway for the route north of Interstate 80. This route could continue north to Pierre, South Dakota, and Bismarck, North Dakota. Beginning at Wichita proceed northeasterly on Interstate 35 to either U.S. 77 or Kansas Highway 177. Then follow either the U.S. 77 or State Highway 177 corridors north to Manhattan (or Junction City). Then proceed north of Interstate 70 following the U.S. 77 corridor north into Nebraska to Beatrice and Lincoln. From there the route would continue to follow U.S. 77 north to Fremont then on into the Sioux City area and terminate as it does in Option 1. This corridor would also connect Sioux City to Lincoln, Wichita, Oklahoma City, Dallas-Fort Worth, Sioux Falls, Fargo, and Winnipeg. Follow U.S. 75 from Dallas north to Tulsa then north to Topeka and then north to Omaha where it would merge with Interstate 29 just north of Council Bluffs, Iowa. This route would directly connect Omaha, Sioux City, Sioux Falls, Fargo and Winnipeg to Topeka, Tulsa, Sherman, and Dallas/Ft Worth, but it would not serve Lincoln directly. Interstate 32 is a designation suggested by Roads and Bridges for the U.S. 87 corridor between Raton, New Mexico, and Amarillo, Texas, as well as U.S. 287 from Amarillo and Fort Worth. Most of this route would involve upgrading existing multi-lane, divided highway. Number considered by Roads and Bridges for Corridor 18 (Interstate 69). Number considered by Roads and Bridges for the Avenue of the Saints Corridor. A new Interstate highway was proposed along the U.S. 49 corridor between Gulfport and Jackson. This Interstate would fall between I-55 and I-65, with Interstate 63 possibly in use for a Western Alabama Interstate. The next available number is Interstate 61, which would duplicate U.S. 61 at the western edge of the state. According to the article “Gulfport to Wiggins interstate sought” by Anita Lee in the Biloxi Sun-Herald (10/29/04), the freeway would be constructed from Gulfport to Interstate 10 to Wiggins to Biloxi in stages, with the portion from Gulfport to Wiggins being completed by 2011. Fayette, Marion, Franklin and Colbert counties to Muscle Shoals. It would connect to Corridor X/U.S. 78, the proposed Atlanta-Memphis Interstate (Corridor 7 from Memphis to Scottsboro, Alabama and Corridor 11 from Scottsboro to Cartersville, Georgia), and Interstate 65. The proposed Western Alabama North-South Interstate is planned primarily to spur development in what’s locally known as “the Black Belt,” which historically has lagged in jobs and income. The idea is that the new highway would help revitalize the area, provide a direct route from western Alabama south to the Port of Alabama at Mobile, and enhance economic opportunities along the Tennessee-Tombigbee Waterway. In the Fall of 2000, a meeting was held to discuss the possibility of a north-south toll highway through the Black Belt. The cost of that project, estimated to cost $2.5 billion to $3 billion, would be partially offset by leasing the highway’s right of way for pipelines, fiber optic cables and other utilities. However, the Alabama Highway Director nixed that idea because of low projected traffic counts. The Interstate 67 designation has been considered for the following potential corridors. The first is U.S. 231 in Alabama and Florida. Alabama DOT has proposed an Interstate-grade highway parallel to U.S. 231 between Interstate 10 near Cottondale, Florida, and Montgomery, Alabama, via Dothan, Ozark, and Troy. At Montgomery, the freeway may turn west to Interstate 65, follow Alabama 271 to Interstate 85, or follow Alabama 271, go past Interstate 85, and loop around Montgomery to the north. According to Phil Holley, Florida DOT is doing a feasibility study on three alternatives, all of which would overlay Florida 79 from U.S. 98 about five or six miles northward to the village of West Bay. From there, the route recommended by FDOT’s consultant, referred to as Alternative B, would run east-northeast for about 20 miles, to about five miles west of Youngstown, then generally north through eastern Washington and northwestern Jackson Counties. It would cross Interstate 10 between Chipley and Cottondale, and hit the state line somewhere northeast of Graceville and northwest of Campbellton. Total length in Florida would be about 72 miles, cost around $710 million, and completion date no earlier than 2010. A toll facility is not being considered. A website, Save Dothan http://savedothan.com, pitched the idea of routing this proposed freeway through Dothan rather than around it. U.S. 31 is slated for improvements between Indianapolis and South Bend. U.S. 31 is already Interstate-standard around South Bend, and Michigan is currently completing its section of U.S. 31 freeway. In October 1998, Lt. Gov. Joseph Kernan announced that U.S. 31 from 96th Street (Interstate 465) north to Indiana 38 has been placed on the Indiana Department of Transportation program schedule for upgrading to Interstate status. The transportation department will also study improving U.S. 31 to raise it to Interstate standards from Indiana 38 to South Bend. Construction costs for the Hamilton County portion are estimated at $308 million. Additional costs for engineering and right-of-way acquisition make the total cost of the project about $465 million. A toll road study for this corridor was mandated by the 1996 General Assembly. The U.S. 31 Coalition Inc., created in March 2000, is a non-profit corporation that intends to make U.S. 31 a limited-access, Interstate-quality highway from Hamilton County to St. Joseph County. The coalition presents unique planning challenges and will probably be a “hybrid” type of project, blending conventional and Interstate characteristics. In Michigan, construction is still underway on the new U.S. 31 freeway between Berrien Springs and I-94 northeast of Benton Harbor. Once completed, the freeway will provide a direct connection to Interstates 94 and 196. Most of the rest of the U.S. 31 corridor between Niles and Ludington is freeway, with one other significant exception. In June 1999, the state of Michigan recommended building a bypass through rural west Michigan to ease traffic congestion on U.S. 31 between Holland and Grand Haven. This limited-access freeway that would cut across Ottawa County farmland. Construction on the project is not expected to begin for at least until 2002, with completion no sooner than perhaps 2015. The proposal still must be approved by federal officials, including the Environmental Protection Agency. The endorsement comes six years after the state first began discussing ways to improve safety and traffic congestion on U.S. 31, which runs along the Lake Michigan shoreline. The options eventually were narrowed to two proposals — the bypass and a plan to build a freeway on the existing U.S. 31. The Interstate 67 designation was also suggested for the U.S. 131 freeway between the Indiana Toll Road and U.S. 31 in Petoskey, with likely connections to Interstate 75 and the U.S. 31 freeway. A newspaper article has considered Interstate 67 as the designation for U.S. 219 / Continental One High Priority Corridor 21 if constructed to Interstate standards. See Jeff Kitsko’s Interstate 67 in Pennsylvania. Interstate 92 is a freeway that was planned in New England along the U.S. 4 corridor in Vermont and New Hampshire. Despite several upgrades made along U.S. 4, this route remains unlikely. The Interstate 92 designation was mentioned in a 1960 Time magazine article. Interstate 98 was considered for two routes. First, feasibility studies were considered for the Northern Tier Expressway or what was also called the “Rooftop Highway” along U.S. 11 between Interstates 81 and 87. The Northern Tier Expressway is part of High Priority Corridor 50, which was enacted into law on August 10, 2005 as part of the Safe, Accountable, Flexible, and Efficient Transportation Equity Act: A Legacy for Users (SAFETEA-LU) legislation. Environmentalists were not pleased with the idea of converting this stretch of U.S. 11 to an Interstate-grade facility due to the rural nature of the region and the potential environmental impacts. However, other interests saw a need for additional highway capacity in a region with constrained transit systems due to a lack of infrastructure. The 2002 “North Country Transportation Study Action Plan and Final Technical Report” corroborates this, suggesting that an expressway or freeway grade facility along U.S. 11 would likely be necessary. As of 2006, NYSDOT was preparing a second study to refine the findings of the 2002 study and develop an “implementation strategy.” Lack of funding for construction of this highway coupled with some local opposition remained an obstacle. There was discussion of a second Interstate 98, an east-west highway outlined across northern Maine. A 1999 independent study concluded that there would be little economic benefit if an east-west highway were to be built in northern Maine. In spite of this, Maine DOT put together a site regarding the East-West Highway proposal http://www.maine.gov/mdot/major-planning-studies/east-west-hwy/homepage.php. It could be called Interstate 98, although no official plans advanced for building this as a freeway or Interstate highway. Since there already was an Interstate 99, the Roads & Bridges article “Interstate 2000” referred to the U.S. 13 (Relief Route) Corridor as “Interstate 101.” The authors indicated that Interstate 101 could run from the Philadelphia metro area south, via U.S. 13, to the Hampton Roads area via the Chesapeake Bay Bridge Tunnel. Then Interstate 101 could turn inland and meet Interstate 40 in Raleigh, N.C., probably via U.S. 13, 17, and 64 (this is now part of the Interstate 87 corridor). DelDOT also considered upgrading U.S. 113 as a freeway across Sussex County. The southern part of this proposed interstate coincided with NHS/ISTEA/TEA-21 High Priority Corridor 13. A substantial portion of U.S. 20 between Sioux City, Iowa, and Rockford, Illinois was converted to Interstate-standard freeway. This proposed freeway would roughly follow the path of U.S. 23 between Standish and Alpena via Tawas City. U.S. 23 north of Alpena, via Rogers City and Cheboygan, are currently not considered for the freeway upgrade. The freeway may be constructed over the Lake States Railway from Standish north to National City, then east into Tawas. The freeway would continue “cross-country” to Oscoda/Au Sable, not following any pre-established road or railroad. The railroad line may be considered for any proposed freeway extensions from Oscoda to Alpena; however, MDOT has not announced plans to that effect, as it is concentrating on the Standish-Tawas segment first. This highway would not be constructed all at once; instead it would be built in stages over a period of many years. The first segment is planned to be constructed from Standish to Tawas City. According to Chris Bessert, there is only one “small coastal town” which would be completely bypassed by this initial freeway segment, and that is Au Gres. MDOT has committed to retaining the current U.S. 23 lakeshore routing in the state highway system, probably as an extension of M-13, and taking pains to sign it as the “scenic lakeshore alternate” route to the proposed freeway. The U.S. 23 freeway suffered a setback in March 2000. At that time, the FHWA asked MDOT to “look for non-freeway solutions to local traffic problems.” However, MDOT is still committed to the project. It is likely that MDOT will add one or more “alternatives” to the study next time around, but it will probably still recommend the freeway alternative to satisfy the federal requirements. And while the MDOT director has stated the department will continue pushing for the freeway, it is unclear when they will come back with their next official proposal. The bulk of U.S. 34 and Iowa 163 were upgraded to expressway standards. According to Mark Bozanich, the Washington State Dept of Transportation (WSDOT) had long-range plans to upgrade U.S. 195 along the Pullman-Spokane corridor. From Interstate 90 at Spokane to Spangle around 11 miles south, U.S. 195 is a four-lane divided expressway. The last mile or so connecting with Interstate 90 was built in the mid-1960s about the time that Interstate 90 opened on the west side of Spokane. From the Inland Empire Way (old U.S. 195) intersection to the north end of Spangle, the route uses older US 195 in one direction and a newer route in the other. From Spangle to the northern outskirts of Colfax, most of the present U.S. 195 was built in stages between the mid-1950s and mid-1970s. The state owns enough right-of-way to widen this section to four-lane divided. The Interstate 90 to Colfax portion of U.S. 195 is limited access expressway with some interchanges and some grade crossings. The WSDOT six-year plan calls for extending the four-lane divided route south from Spangle to Plaza, an unincorporated community a few miles north of Rosalia. Colfax will need to be bypassed to complete a freeway or expressway from Spokane to Pullman. The existing U.S. 195 from the southern outskirts of Colfax to the NW outskirts of Pullman would also be replaced by four completely new lanes rather than adding two new lanes to the existing roadway. From the NW outskirts of Pullman to the east side of Pullman, the state owns right-of-way to build a north Pullman Bypass. The revised Code of Washington (RCW) refers to this route as Washington 276. It is my guess that when this bypass is built, Washington 270 will be dropped from the state highway system thru Pullman and that the bypass will be posted as Washington 270, not 276. Long range plans call for widening Washington 270 to four lanes from the SR 276 junction east of Pullman to the Idaho State Line. Plans in Nebraska called for upgrading Nebraska 2 between Lincoln and Interstate 29 to expressway standards. Dennis Smith of Nebraska reported that as of November 1998, he had not heard of any plans to upgrade Neb. 2 to Interstate standards. However, the highway was upgraded to expressway standards over the previous several years. Nebraska 2 was initially converted to an expressway segment from Nebraska City westward for about 12 miles. A subsequent expressway segment opened from 84th Street in Lincoln east to the junction with Southbound Nebraska 45, just north of Bennet. Work on the remainder of the route between Lincoln and Nebraska City followed. Except for a slight relocation to provide for an overpass at Nebraska 50 at Syracuse, the new expressway follows the old alignment. A new south beltway was proposed for Lincoln which would run from the N-2 expressway in the Cheney area to the U.S. 77 expressway. officials from the Massachusetts Highway Department (MHD) and the Southeastern Regional Planning and Economic Development District (SRPEDD) initiated studies of necessary improvements in order to convert the Fall River Expressway into an Interstate highway. According to their studies, upgrades to Massachusetts 24 required to bring the highway to Interstate standards would cost approximately $300 million. See BostonRoads.com: Fall River Expressway (MA 24).